On 11 March, 2012, YNaija published an article from one of our Frontpage columnists, Ebuka Obi-Uchendu. His article talked about the catatonic state of our health system and the reaction generated from the article was immense. Following this article, Idris Bells published another article on his blog soon afterwards. It was in line with Obi-Uchendu’s piece though it had been in the Guardian and other news blogs five years ago. “Sadly as events in Nigeria’s health sector have not fared much better since then, I have decided to republish it again today!” he said. How does one begin a sordid tale like this? How does one begin to recount the atrocities of a nation that derives joy from murdering its best people in their primes? How do I relate how the striking doctors colluded with the Nigerian government to kill my bosom friend? 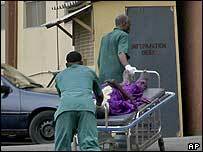 How do I narrate the events that led to the death of Hameed Olasupo Agberemi on 5 March, 2007 at the tender age of 32. …I also realise that something will be the cause of one’s eventual death, and in this case, the causes are inexcusable, as they depict a failure of the Nigerian system. … His final journey began late December without any warning. He lived in Eleyele, Ibadan with his wife, a practicing lawyer and their daughter. He left the house on the fateful day and made to cross the road to enter a commercial bus. Having checked to ensure there was no oncoming vehicle, he started to cross, when from nowhere, a commercial bus driver at top speed driving on the wrong side of the one-way road crashed into him, inflicting serious head injuries and sending him into an unconscious state. He was rushed to UCH, Ibadan where he spent two weeks in coma before regaining consciousness. Since then he had been undergoing several surgeries and was getting better. I had even called several times and spoken to him on phone, and apart from some slight slur in his voice, he sounded almost like the Hameed we had grown to admire and respect. Some weeks later, some complications arose which blocked his trachea and affected his breathing, prompting a surgery which was carried out to fit a breathing tube into his trachea to aid his breathing. The doctors planned another surgery to remove the breathing tube and fix the trachea complications, but this was complicated by the fact that UCH, one of the topmost health institutions in Nigeria did not have a laser knife which was required for the surgery. Hence, they had to reschedule another surgery, while Hameed continued to breathe with the aid of a tube. It was in the midst of all these that Nigerian doctors decided to go on strike. I will not waste time debating the rightness or otherwise of the strike action as it is of no use to me or the bereaved family. I only know that it was one strike too many. Hameed was compulsorily discharged from UCH last week despite his critical situation and before the scheduled surgery, and the family had to make arrangements to take him to a private clinic in Ibadan, while praying that the strike action would be called off soon. On Sunday night, the 4th of March, 2007, complications arose with the breathing tube. The private doctors tried their best, but not being specialists in that field or being familiar with his case, it was to no avail. For several gruelling hours, they laboured, while my friend gasped and struggled to breath, but at the end he returned to his Creator. If it was in more advanced countries, I would have dared to sue the government and the striking doctors for complicity in his death, but knowing Nigeria, it will be a wasted effort. I know Supo is not the only casualty of this strike, and that saddens me about the country called Nigeria , that cares not whether its citizens live or die. It is eight years since we have had a ‘democracy’, and while the president and his vice fight themselves over sordid allegations, the citizens are left to die away. The common people can die all they want as long as the PDP has its way in the do-or-die affair it calls an election. If only a fraction of the money spent on flying presidential candidates and other government officials abroad for medical attention were to be spent on our health system, perhaps more lives will be saved. But who cares? Doctors are trained to save lives, but when their actions or inactions lead to loss of lives, doesn’t this speak volumes? I hope the doctors enjoy their allowances when and if they get, it but I will always remember their role in Hameed’s death. May God Almighty forgive Hameed and grant his parents and family the fortitude to bear the loss.